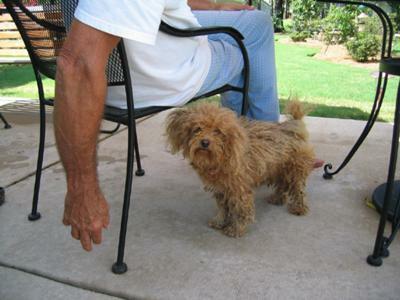 There was a little stray dog that had roamed around the community for weeks. We would occasionally see him usually being chased by someone trying to catch him. No one could because he was like a Little Ghost - now you see him now you don't. Eventually he started hanging out around our home, because of a little female next door. I started leaving him food and water but never tried to chase and catch him. He eventually started to trust us, and when we bought a little bed for him to sleep in at night, that was it! Because it must have stirred a memory of his former times. He wasn't going anywhere. We gathered him up and headed to the animal shelter where they checked for fliers and a ID chip but none were found. So the next trip was to the vet (PICTURED). His hair was in dreadlocks. He was flea infested and filthy. They groomed him (short for scalping), bathed, gave him shots, a physical, ID chip, and neutered him. When we went to pick him up the next day the vet said, "You won't believe this is the same dog you brought in." The vet estimated his age at 2.5 to 3 years old. We named him "Pepe" and he decided to adopt us on July 31, 2009, so that is his new birthday.